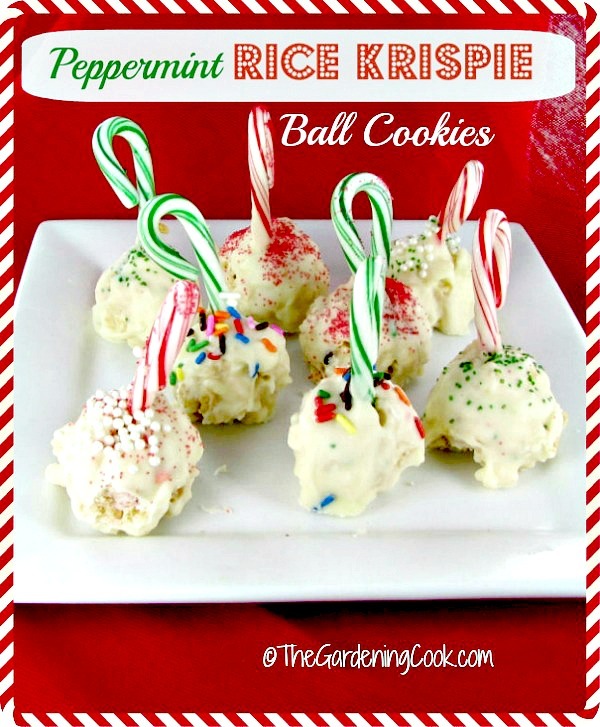 These peppermint Rice Krispie ball cookies are so tasty and look really festive too. 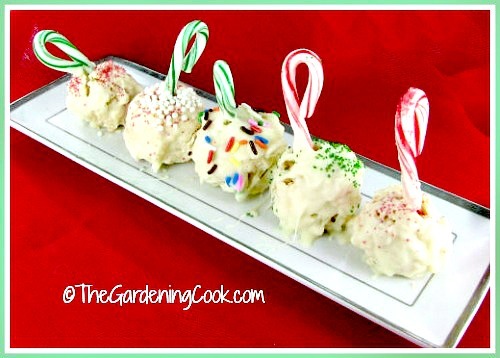 They have a crunchy cereal base dipped in white chocolate with a fun candy cane holder. I love making cookies this time of the year for cookie swaps. 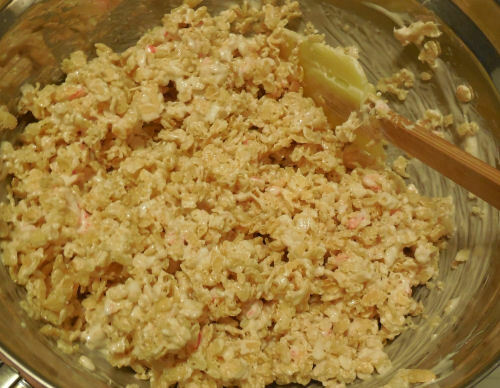 Another great Christmas cookie recipe is the one for lemon snowball cookies. 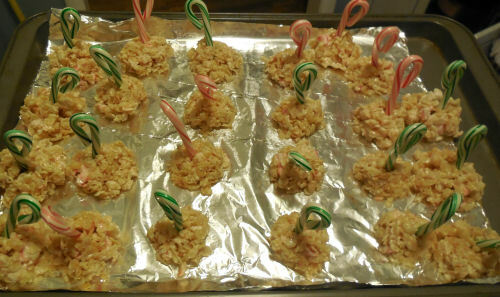 They bring out the holiday spirit just like these Rice Krispie ball cookies do. This recipe is one of those that I think is going to be so simple when I start and then I end up spending much more time doing them that I ever thought they would take. But, trust me, sometimes that extra effort will end up being a really great addition to your holiday table and it is so worth the time to make them. Treat Your Family to These Peppermint Rice Krispie Ball Cookies. I first saw these on She Wears Many Hats as a sponsored Rice Krispie Recipe. The original recipe called for pink and white peppermints but I found some mixed colored sticks at my local store and decided to give the recipe a try. All I can say is, be prepared to devote some time to making them – but the time you spend on them will pay off in the taste department! I served them the other night at a Christmas party and they were a huge hit. I ran into some – shall I say “shaping problems” along the way, as well as a few issues with coating and how the peppermints sticks look. But never fear, I’ll show you some of the tricks that I learned as I made them, so the whole process should be much easier for you! The first step is to unwrap your peppermint sticks. I used a 40 count package of red and green striped ones. The recipe will easily make this many but you will need to save some of the peppermints to crush up. 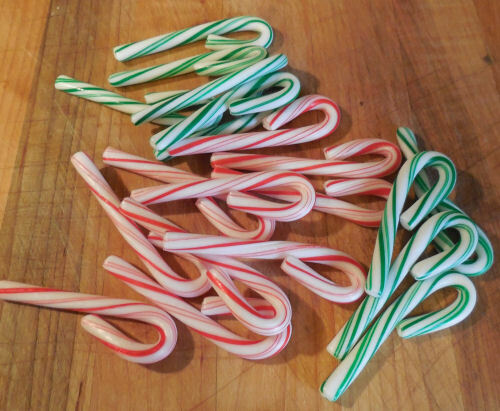 If you want to use a different flavor of Candy canes for your cookies, you can find a big selection of them on Amazon. I reserved several of the pink sticks to crush up. The two peppermints had slightly different flavors so I wanted just one for the Rice Krispie mix. Place them in a plastic bag and then hammer them with a meat tenderizer. 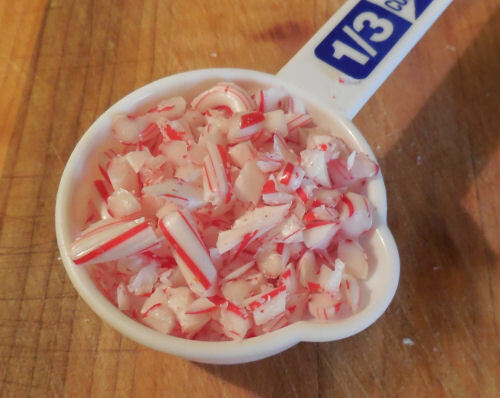 You need 1/3 cup of the crushed peppermints. Once they have been crushed, set them aside. Start by melting a half a stick of unsalted butter. 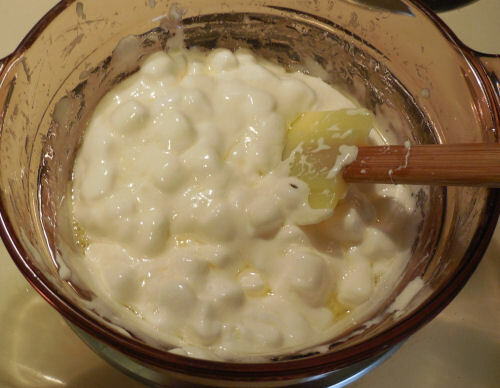 Stir in a 10 ounce package of mini marshmallows and cook until they melt and the mixture is smooth. Add the crushed peppermints and combine well. Place 6 cups of Rice Krispies in a large bowl. Stir in the melted marshmallow and peppermint mix and combine well. Now comes the hard part. I thought I would be able to make the balls with my hands and just insert the peppermint in the top. All I got was a big mess of Rice Krispie mix all over my hands. I ended up using a large tablespoon and putting the mixture on aluminum foil and then using a teaspoon to sort of coax them into a ball shape. The peppermints will not stand up straight at this stage either. Don’t even bother trying. Once they are chilled, they will stand straighter. Place the balls in the refrigerator for 10-15 minutes to harden. 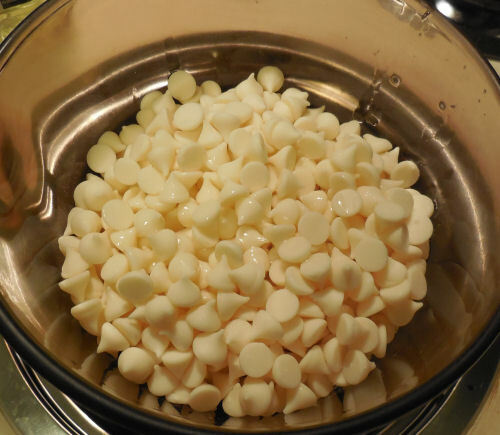 Now put the a 12 ounce package of white chocolate chips and 2 tbsp of vegetable oil into the microwave and cook for about a minute or two until it has melted. If the mixture it too thick add a bit more vegetable oil. When the balls have cooled and hardened, remove them from the fridge and now try to make them into bar shapes and straighten up the peppermint stick. The mixture is not nearly as sticky when cooled and is easier to work with. Coat the balls in the melted chocolate and sprinkle with assorted festive sprinkles. I could not manage to dip them in the chocolate. TIP: I found that the peppermint stick would pull away if I tried dipping the balls. Instead, I just dunked the bottom half in the mixture and then used a teaspoon to coat the top of it. Not an easy to do recipe but they are very festive and my guests loved them. I never was able to get a perfectly round shape. Perhaps you will have more luck! 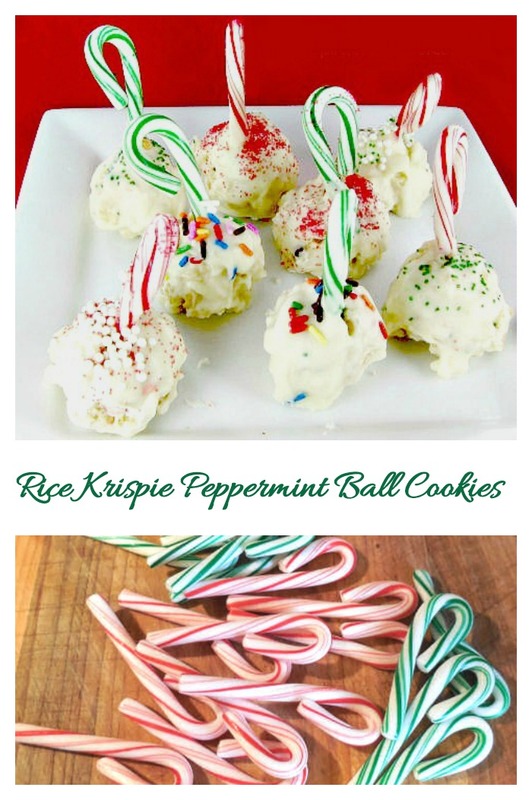 Admin note: This recipe for Peppermint Rice Krispie Ball Cookies first appeared on the blog in December of 2015. I have updated the post to add a new printable recipe card and video for you to enjoy. 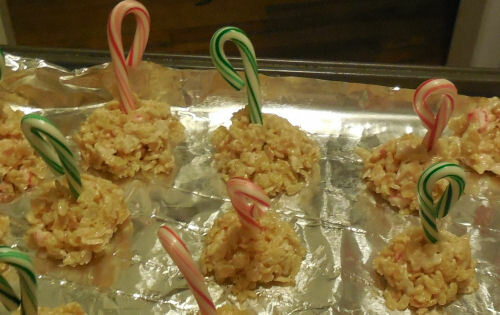 Would you like a reminder of this recipe for Peppermint Rice Krispie Ball Cookies? Just pin this image to one of your Holiday Dessert Boards on Pinterest. 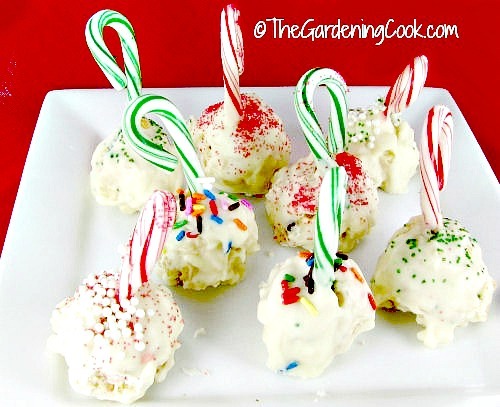 These Rice Krispie ball cookies have a crunchy base dipped in white chocolate and a fun candy cane handle. Unwrap your candy canes and reserve some for crusting. 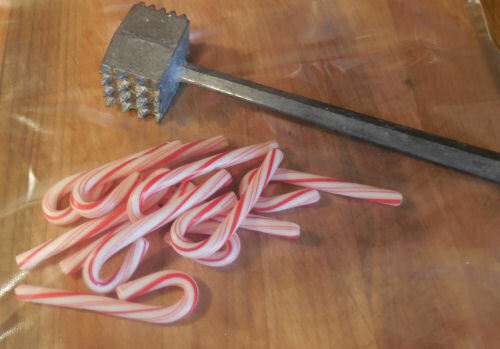 Crush 1/3 cup of the pink candy canes and set the unwrapped canes and crushed ones aside. 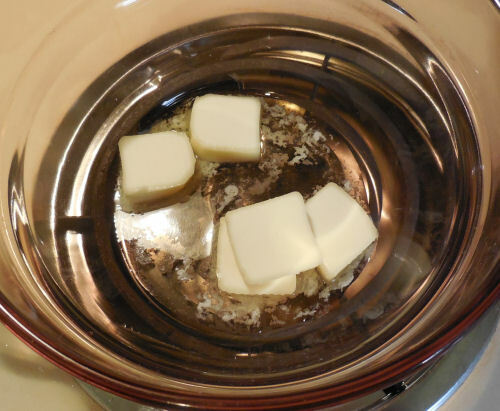 Melt the butter in a large saucepan over a medium low heat. Stir in the miniature marshmallows and allow them to melt completely. 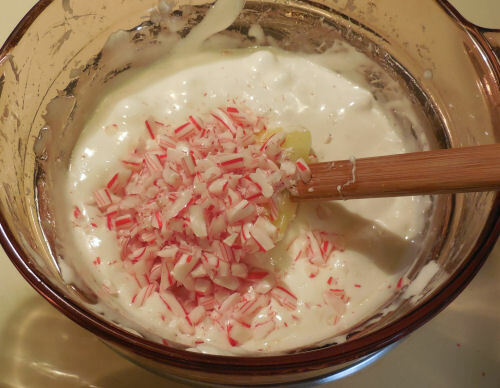 Mix in the crushed candy canes. In a large bowl place the Rice Krispies. Mix in the melted marshmallow mixture and combine well. Place your finished treats into the fridge for about 15 minutes to set. 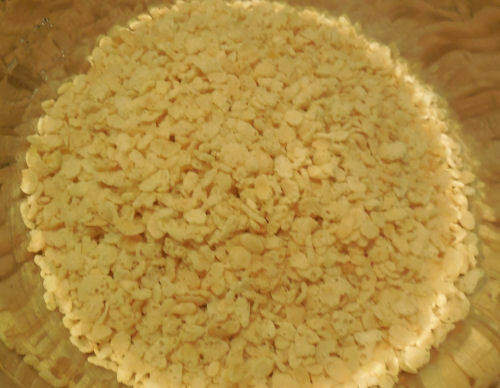 Melt the white chocolate and vegetable oil in the microwave for 1-2 minutes stirring mid way through. Remove the treats from the fridge and reform into better shaped balls. Be sure the candy cane is straight and securely in the middle of the ball. Dip the bottom of the cooled treats into the white chocolate and use a teaspoon to add chocolate to the top of the ball. Sprinkle or decorate as you wish, and set aside to cool and harden completely. The balls are much easier to form when the mixture has cooled a little. One thing I have discovered while making RK balls with kids – if you let the mixture cool for a minute or two then you can form balls easier. I was having the same problem as you with the mixture not working with me but then I helped a kid who had been waiting a few minutes and it went much easier. The next batch I tried waiting for a few minutes and they went sooo much easier. I lightly coat my hands with butter or margarine to keep the mixture from sticking to my hands.